Summer is in full swing, which means-pool days! Pool days are my fave during the summer! Its just a day to relax and get some sun, all while having fun! 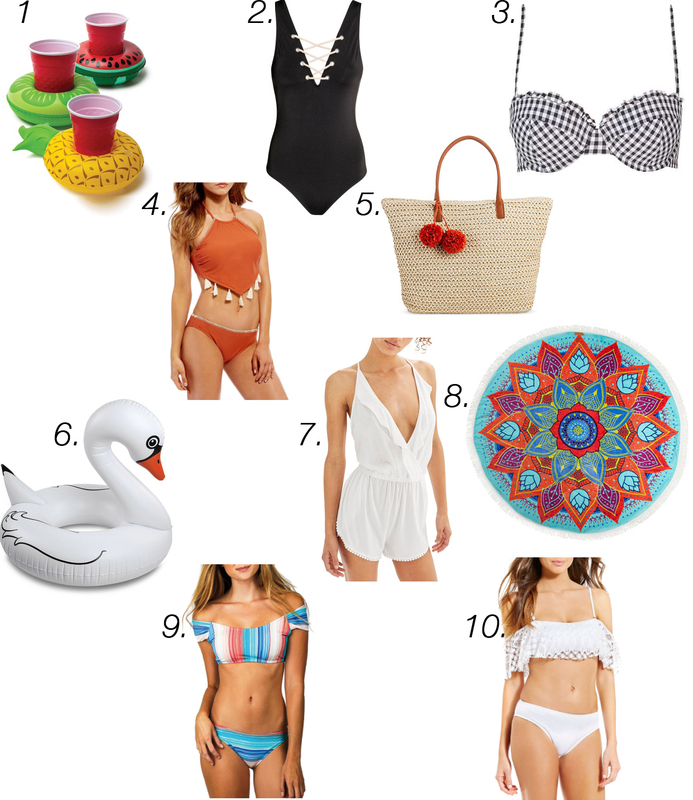 Below, I have round up some suits and other things that would be perfect for your pool day-or beach day! How adorable are these little drink holders!? Perfect for lazy days laying out in the pool! This swimsuit has a nautical feel, which I love! The lace-up is too cute & it shows just the right amount of skin! I have a thing for gingham lately. This top is ADORABLE! Love the cute little ruffle detail! This comes in a few other colors as well! I LOVE the tassels! Gives off some boho vibes and I love it! A big tote is always a must-have at the pool or beach to tote around everything! Love this one & it's much cheaper than many other straw totes at under $20! Because who doesn't want one of these?! I love these floats! This would be perfect to throw on and walk down the beach, or to put on over your swimsuit! These round towels are so cool! I love the colors in this one! I'm obsessed with the colors in the suit! Love the off-the-shoulder! This comes in black & white and is so cute! !